Ahhh…I’m so happy! Memorial Weekend will be coming up before you know it…(like a week and half from now!) 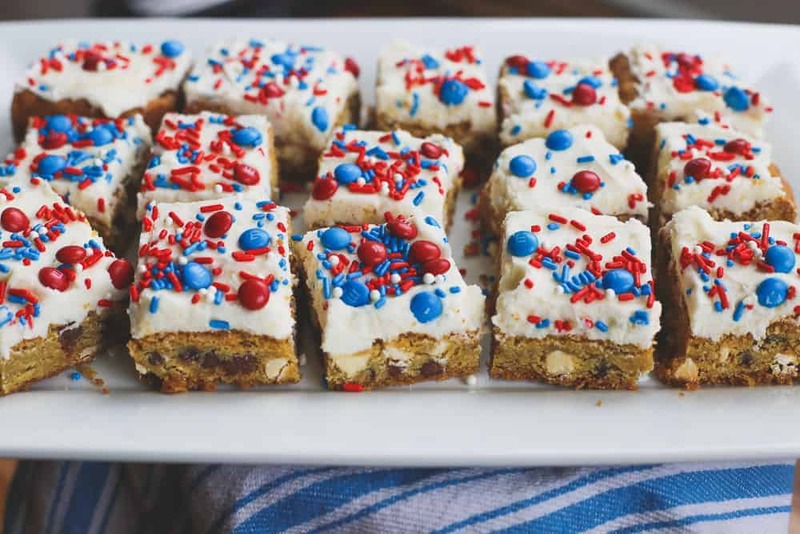 and I need to get to crackin’ on sharing some patriotic treats with you that I know anyone in your circle will love! 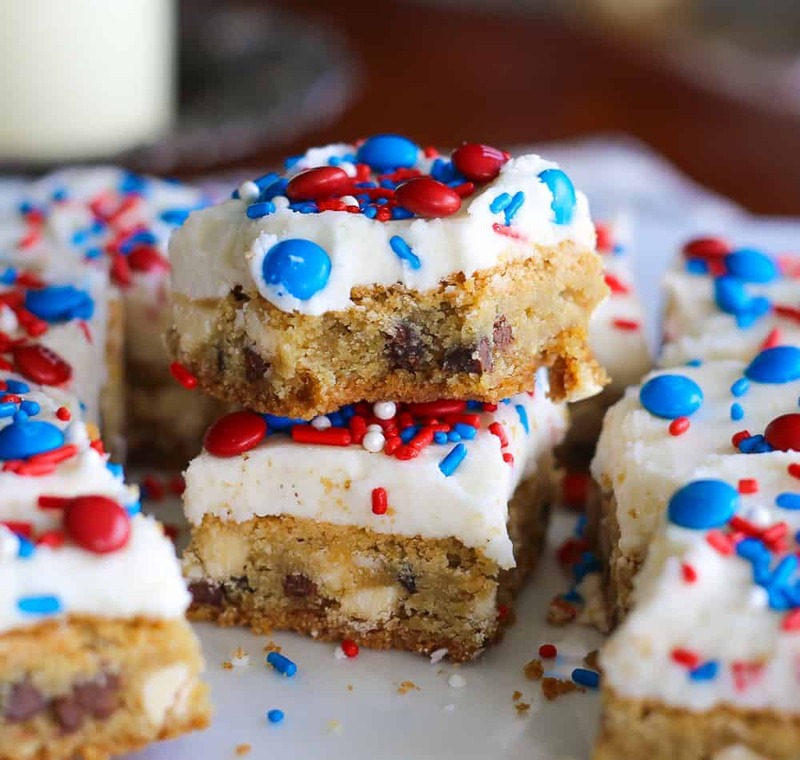 So, these Red White and Blue Chocolate Chip Bars are these wonderful, chewy, buttery cookie bars that have just the right balance of vanilla milk chips and chocolate chips. 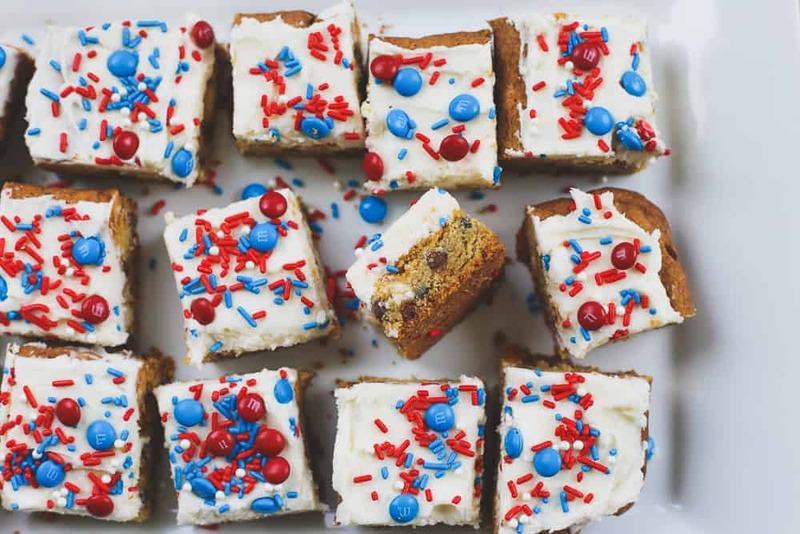 A delicious layer of tempting vanilla buttercream and some high-spirited red, white and blue accessories to make it red, white and blue ‘official’! You don’t know how hard it was for me to make these with vanilla frosting versus chocolate frosting on these, but I’m glad I went with vanilla buttercream. …and I like salt in my frosting. It really brings out intense flavors of the vanilla extract and butter. 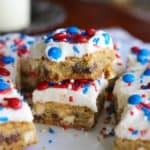 I usually add just a touch more to chocolate chip cookies and bars when I bake them on any given day. For flavor in food, whether it’s savory or sweet, a little salt can take flavors to another level. It cuts the sweetness a bit. Like this Best Home-made Salted Caramel Sauce. A lot of salt, is not good. But you know this already right? But tell me, do you love it when you can taste a tinge of salt in your cookies and vanilla frosting like me? So, this past weekend our son moved out, so I made these for him as a going away ‘yummy’ to take along with him. I’m going to hate that he’s not here to eat the sweets now, but I’m hoping he stops by often so he can take them off of our hands. I don’t want these staring me in the face for any number of days because you know why. 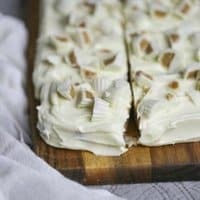 These are sincerely, the most perfect sweet treat to share when you’re having a picnic, a barbeque or those family gatherings for your weekend for sure! And remember the red, white, and blue accessories! 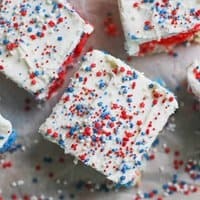 For more red, white and blue ideas, check out 20 Red, White & Blue Patriotic Desserts to Proudly Hail!! 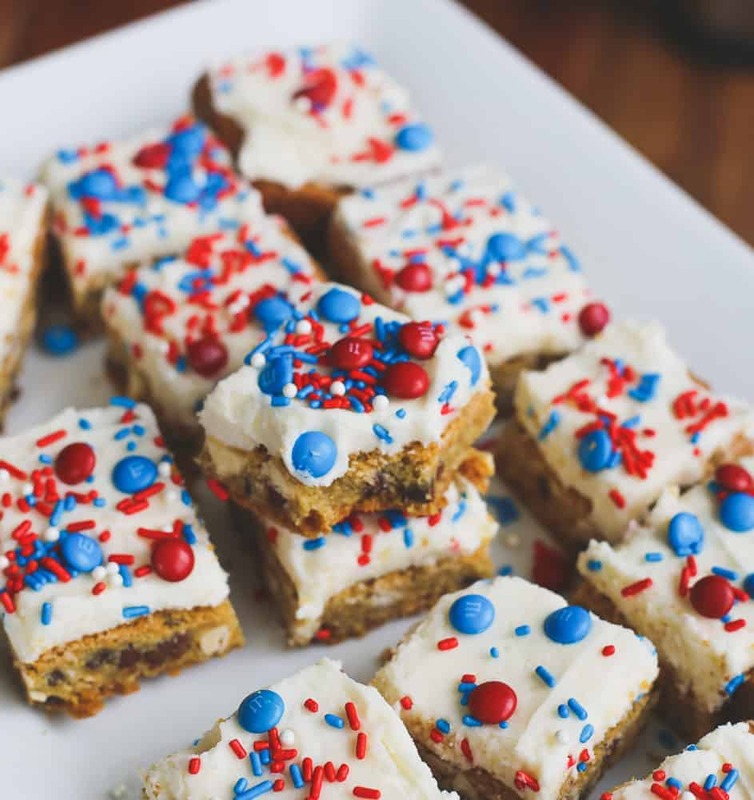 These are sincerely, the most perfect sweet treat to share with your circle of friends for the holidays of red, white and blue! Preheat oven to 350 degrees and line a 9x13 pan with foil and spray with cooking spray and set aside. Using mixer, add butter and sugars together in a mixing bowl and mix on medium-high speed until smooth and creamy about 2 minutes. Add eggs and vanilla and mix until combined, about 1 minute. Add in the flour mixture to the wet mixture and mix together until combined. Stir in chocolate chips using a rubber spatula. Press cookie dough evenly into pan. (I lightly spray my finger-tips with cooking spray to make it easier or you can do it with a rubber spatula. 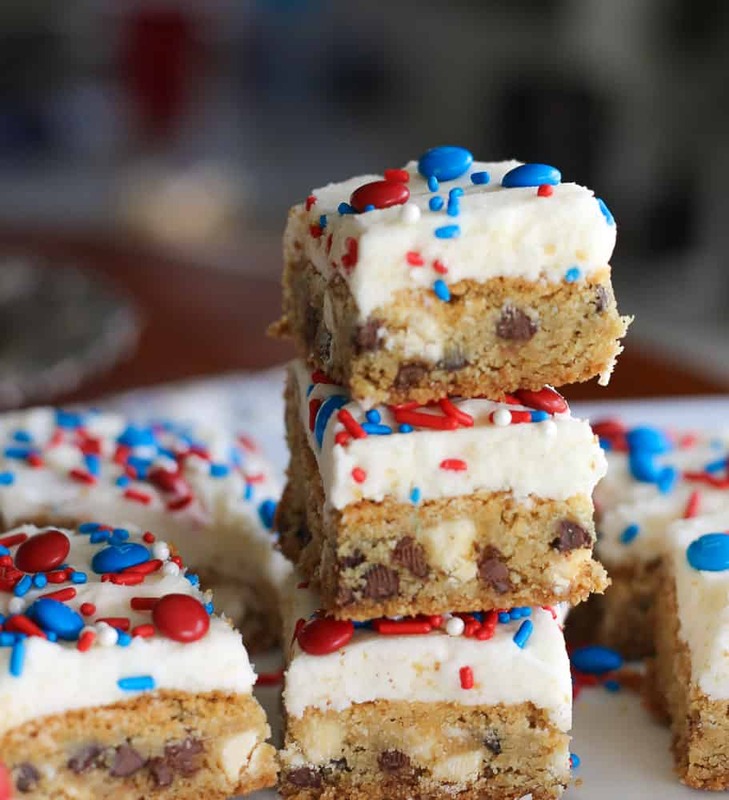 Using mixer, mix all the ingredients together until creamy and frosting consistency you like. You can add more powdered sugar if you need it to be a little stiffer or add in more cream if you need it more creamier. 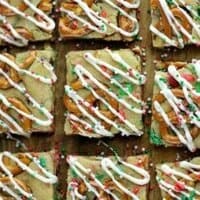 Frost cooled cookie dough bars with frosting and add decoratives immediately after frosting, because the top of the frosting will firm up, so they won't stick. Vanilla Buttercream Frosting frosts a 9x13 pan, about 1 1/4 cups of frosting. I need a little salt in my sweets. The other day I was making frosting for cupcakes and when I tasted it something was off, so I looked at the recipe and realized I’d forgotten the salt. It’s amazing how just a tiny bit makes the flavors pop! Your son is lucky that he can pop over any time and find some sweet treats–and you’re lucky to have someone to pawn them off on , haha! Yea I am glad I can pawn them off on him and his friends for sure! Thank you Kelsie and yes that little bit of salt is KEY! Happy Weds!! Yay for summer and all the festive recipes!! I might use this for Canada Day and leave out the blue 😉 Yum! OMG yes for sure Katherine! I love it when you can change up the sprinkle colors for whatever occasion. I hope your enjoying your baby girl!! Awww…I remember those days, lots of snuggles and kisses. My mouth is watering. Love these. Thank you so much Teresa!! They are pretty tasty!! The texture of this is outstanding. Couching it with a big skillet of these sounds totally amazing! Ha! Great idea Maria!! Thank you!